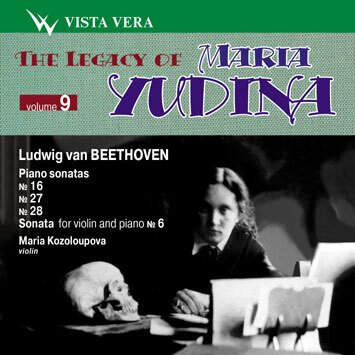 Maria Yudina was a recognized expert on Beethoven. All musicologists while making note of her arguable interpretations of the romantic music unanimously accepted that playing Bach, Mozart and Beethoven she was in her element. In the music of these composers Yudina appeared in all her magnitude and raised to the height of true irradiation. Her interpretations of Beethoven's Sonatas No 29, Sonata No 32, Piano concertos No 4 and No 5, 33 Variations may be likened to the summits shining in a chain of mountains of the world greatest performance of Beethoven's music. Yudina's interpretations of Beethoven's sonatas strike above all by a multi-dimensional image of each work, the entirety of the concept, very accurate details closely bound together, absolute sincerity, very high emotional and ethical tone. One can hear all this in small works like early Sonata No 5 and in a more extensive Sonata No 16 and in a monumental opus 111. When reflecting upon Yudina's interpretations of Beethoven's sonatas one would always become aware of astonishing vivacity of her performance. The music that comes out of her fingers is full of life, sparkles with wittiness, fascinates with childish innocence and purity, disarms by the purity of her soul and by a wonderful capacity for taking different images. All this calls forth admiration from every listener. One wonders how is it possible especially from an artist who has a propensity for monumental forms and profound philosophical interpretation of music. A great pianist displays a truly rich imagination, a rare diversity of sounding that sometimes comes as if not from under her powerful hands, amazing flexibility of intonations, a very subtle use of nuances, an almost inaudible breathing inside a tune or a phrase, unpredictable turns of thinking. Paradoxically as it may seem all this makes Yudina's perfect interpretations seemingly incomplete as if opened for further work of imagination. There is still no full stop here and will never be. A great pianist creates music every time anew and as to recording… Well, it only retains for us those moments of creative work. There is another very important consideration about Yudina's interpretations of Beethoven's sonatas. And that is her surprisingly easy handling of tempo. Maria Veniaminovna proves to us that Beethoven's strict tempo and rhythmical structures do not rule out a possibility of rubato. Beethoven himself provides enough grounds for that. Every now and then we come across, especially in his late works, the composer's notes like retardandi which means sort of hesitations, deliberations; or fermati that is questioning, bewilderment that may cause a sudden change of mood; and then again - a tempo. Or, as if Sonata No 30, after impetuous vivace a sudden adagio and then again vivace. However Yudina feels the need for freedom to chose tempos and rhythm also in Beethoven's early works and she makes use of it in a very convincing way and with an impeccable sense of proportion.